Google censored its homepage logo in the US to protest against two bills that could damage the Internet and destroy its core values. "Two bills before Congress, known as the Protect IP Act (PIPA) in the Senate and the Stop Online Piracy Act (SOPA) in the House, would censor the Web and impose harmful regulations on American business. Millions of Internet users and entrepreneurs already oppose SOPA and PIPA," explains Google. 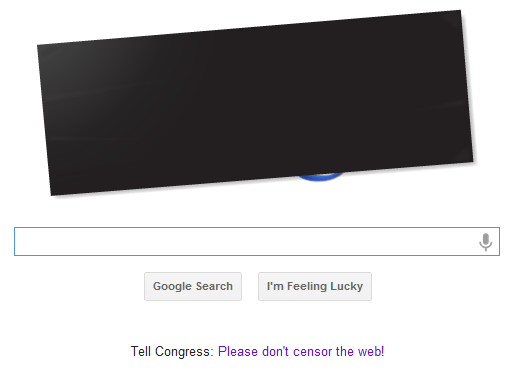 Google's homepage also includes a link that asks users to "tell Congress: please don't censor the Internet." The censored logo is only available in the US, but the link is also displayed outside US. While the new bills may seem to be well-intended, they're easy to abuse and they'll not stop piracy. "These bills would grant new powers to law enforcement to filter the Internet and block access to tools to get around those filters. We know from experience that these powers are on the wish list of oppressive regimes throughout the world. SOPA and PIPA also eliminate due process. They provide incentives for American companies to shut down, block access to and stop servicing U.S. and foreign websites that copyright and trademark owners allege are illegal without any due process or ability of a wrongfully targeted website to seek restitution," mentions a Google blog post. Google's suggestion is to cut the funding for pirate sites. For example, ad services would be required to stop providing ads for sites created to infringe copyright and payment services would no longer be allowed to intermediate transactions between US residents and the company that owns the pirate site. I'm not sure that's a great idea because this law could also be abused. Note that the cached version of Wikipedia's pages are still available via Google. Just hover over the preview arrows to the right of the entry and select "Cached." I didn't think Wikipedia would go all the way offline, they just want the appearance to gain support against SOPA, so they can continue their support of unpopular anti-american idealogies, as well as releasing all sorts of crap your common American could give a darn about. To me Wikipedia is a threat to this country, which is why the owner ran with his tail between his legs to escape a prison term. Not as good a they could have done, they could flooded their entire advertising network if they choose to but it better than the likes of Microsoft and Facebook and Twitter are doing. An I love how the media mongols are moaning about internet company abusing power and interfering in congress and democratic process/, something those would not have a clue about because never in a billion years abuse there own position of power. An they also have not paid single cent to a congressman to pass this registration have they. Why did Google "black out" the logo instead of whiting out the logo? Isn't a blank page even faster? That is the entire premise for Google's all white logo only page. 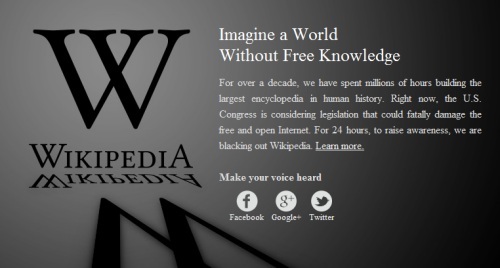 sopa caused a black out that why they followed the term. I'm really disappointed with how Google has handled this. They've wasted a great opportunity in so many ways. Probably the worst part of this is their message calling on the same legislators that are proud of their ignorance regarding the internet, and are payed off by the MPAA and RIAA,to create even more laws that impact the internet, which is EXACTLY how we got to this point today. New laws are not the answer. As several people have pointed out elsewhere this past week, this is an example of old industry models refusing to innovate to take advantage of new technology. These industries have been drug, kicking and screaming, all the way. Many people are probably too young to remember when these same industries fought videotapes and compact discs as well. I disagree. Reform is gradual process and Google has taken action against these bills in a way that few fortune five hundred companies would. IBM? Microsoft? Zuckerberg's late messages in opposition? Yes, I would like to see even more done. But I am grateful for the effort rather than "really disappointed". You won't really notice it, unless you make a habit of using illegal sites, for illegal activities, or those companies that do business with such sites, otherwise that you are not loosing any freedoms, they are merely protecting the ones you already have. welcom to new china internet! Yeah but google doesn't have a problem with the SOPA that it enforces in CHINA? What's the difference don't all people deserve free speech? Thats the great misunderstanding, is that SOPA has nothing to do with free speech. The government is simply trying to protect us against the content from other countries that would prove harmful to us. I got no problem with that, and you will always be able to voice your opinions. SOPA is only trying to protect us. If they want internet, let their government create their own system, so they won't exploit ours for our US dollars. How many times have you gotten some nigerian scam in your email, because SOPA wasn't in place to keep that crap out of our country. How many American's have been scammed from these people using our internet? Too many, and its about time the government did something about it. First of all, that defeats the entire purpose of the internet. Second, that isn't what SOPA does. that would defeat the purpose of the internet -to be globably linked. Are you saying I should be able to talk to family in other countries through the internet? so many fake situations to get emails+ are out there...this seems -since it is on the google page itself..and that it is blacked out-makes me feel it is "real" and certainly worth signing. i just want to know how-when clicking on the link and signing: will my information needed to sign be safe. and private. -again-while i find all this to be safe-i still am not 100% sure. .....also-on this page-to the left-the UNOFFICIAL blog--in the words they put it (leaving out links to click) -"..that watches Google's attempts to move your operating system online. basically--i worry about loopholes in any privacy set-up. as for signing the petition set on where the google page opens-i guess it would be nice to know how safe it is to do it or not. thank you. I was wondering how Google would show its support. BTW, and I don't know if this is also part of Google's SOPA support, but if you drag and drop an image on Google Images, it doesn't do a search but instead takes you back to the Google homepage. I'm so glad google is protesting, because some of their stupid google pictures really added some unneeded frame rate to my browsing. Maybe they'll just protest in their own country, and stay the heck off of our internet. They only use it for monetary purposes, which don't do us anygood, now they want us to fight their battles for them. I hate their services anyway, so good ridance to them all. The more companies protest, the better frame rate I'll get, be so indirectly, or directly. Tell congress not to censor the web? You idiots! Congress is not trying to censor anything that doesn't need to be censored. You are nothaving your rights taken away, you are having your rights protected against those among us who should not be among us, who would try and use our own system, and our internet to wage their illegal actions as well as terrorists actions against us. You can protest all you want, because we honest computer users do not rely on your stupid services anyway. By fighting this bill you may as well join al-qaida yourselves, because thats who you are helping by allowing them to exploit our internet. I think you are a little bit stupid and coward, anonymous. Maybe you are a supporter of republicans? And in which way internet is your? For people like you there is a beautiful place in Italy: Piazzale Loreto in Milan (http://en.wikipedia.org/wiki/Piazzale_Loreto). The best place for all the mussolini like you. Oh, no! Google's Rated-R now...thought it would happen a lot sooner though. Google can go to hell! Honest American Businesses will not suffer from these deals, if any honest companies still exist. If these bills are not passed, I'll know for sure the answer to that question. If your an honest corporation, and you do business with only honest legitimate companies, then you have nothing to worry about. It's all these foreigners starting up websites that are popular in America, that raise all the concern, spouting off how American's are lossing freedoms. We must be the laughing stock of the world, because anti-american's know all they have to do to rile us American's up, is to tell us our own government is trying to take our freedoms away from us,which they are not! Our government is trying to protect us against these people. STOP FIGHTING AGAINST THE PROTECTION THIS COUNTRY NEEDS. Fight pirates, fight terrorists, and all those so called foreign owned american companies trying to rip us off. SUPPORT THESE TWO BILLS. Internet usage will not be affected by those of us, who utilize the internet as it was meant to be used, only those using it the wrong way will be punished. So if you no longer see a website up that you visit often, just know that they wern't as honest as they were leading us on to believe. How the internet was meant to be used? by bashing foreigners and not properly using grammar? Have you even been to a 'foreign'country? I have always understood that the internet and all of its marvelous glory were the productions of computer geeks. As a computer engineer myself, I believe that we get to decide how the internet is meant to be used - not closed-minded bullies like yourself. Of course, you don't understand how these bills could affect us because you only use the internet to check your Hotmail account. I encourage you to read further into this subject, in particular the actual wording of the bills. It is quite elusive, indeed. It even has a clause that protects the government from suit when they "accidentally" make false claims and shut sites down for no reason. It's a pull the trigger and ask questions later scenario. Do you REALLY believe this is healthy? I buy all my games with my own money! And if I want music I buy it honestly. I do not go online trying to see what I can rip others out of, or what I can steal from websites that offer illegal things. Freedom of speech has nothing to do with freedom to steal or support those that do, any software, games, music, or whatever, found on the internet. How many times have you gotten a virus because something you downloaded was infected? These two bills will minimize the threats that we honest computer users go through. I can wake up in the morning have my cup of coffee and do what ever I normally do, even with the two bills passed, so we are not loosing any freedoms, so don't be pulled in by popular labels such as Wiki and Google; Do not follow in their lead, because once you win their battles for them, its back to the same ol' crap from them. They arn't telling you what they're doing with all your login's and user passwords, there's a lot of things these big internet names are not telling us, that the US government is trying to protect us from. We have the enemy right here in our own country, which makes it hard to fight them, because they dress like us, they create business's, they smile, shake your hands, drink beer with you, while on the inside, they hate our guts, and they want us to join with them, to tell our government not to protect us, well, that's not going to happen. I support our Government in this action, and may all those that do not support it, may they end up in Guantanimo Bay for all I care. "I support our Government in this action, and may all those that do not support it, may they end up in Guantanimo Bay for all I care." El aire el agua la tierra, todo se mercantiliza y las ganacias se privatizan y los costos se socializan...se viene V de Vendetta. this law is cazy obama said hed create jobs and hes just making 1000s and 100000s of people will lose there jobs if this goes throw not only that but the internet will be borning forever im only 11 and if other people dont see this an your really dumb!! even an 11 year old can understand the repercussions. Obama doesn't support this bill. Do your research before you complain. Voting age or not, what you say effects others, so please get your facts straight. You go ahead kid, wheather or not Obama is for PIPA or SOPA, he has done many other things that we will suffer for years to come. Its a shame our first black president will probably make it harder for the next black person running for president to be elected. Say good bye to karakoe, vidoe taping your kids singing/ acting out movies, sharing these and photos online. Simple disclaimers will not be enough.. you could be fined or have to appeal to court. Harmless fun, a few riped off dollars for the uncountable number of jobs and memories(facebook/blogs ect.) lost. "So if you no longer see a website up that you visit often, just know that they wern't as honest as they were leading us on to believe." ...wake up and smell the coffee, suckers. Just who says the site wasn't as honest as we'd thought? You're not seriously suggesting that because the U.S. government decided so, it must therefore be true are you? That's got to be one of the most ludicrous, ridiculous statements I've heard and shows that you're obviously incapable of independent thought, trusting everything that officials and governments tell you. FYI, most governments (including, if not especially your American one) do not have the needs and wants of the people that elected them at heart. People go into politics for no other reason than to feather their own nests and if you believe different, like some overwhelming urge to help their fellow citizens, then I pity your lack of intelligent and reasonable skepticism. I find it hard to believe that any grown adult with half a brain can be so sheep-like and trusting that all will be well if these laws are passed when nothing could be further from the truth. All governments constantly seek more and more ways to control the populous and take more and more of their money through stealth taxes and the like to keep them just above the bread line. This isn't about stopping piracy or spam. Neither is it a case of if you support the new laws then you're a fine upstanding citizen and if you don't, then you must be engaged in illegal activities as you're suggesting. This is about controlling (censoring) what data people can or cannot access on the internet and despite what you may think, it does not belong to America (thankfully). It will be another nail in the coffin for freedom if they get passed and you will get what you deserve if you just lay down and accept it now. By that I mean it's the thin end of the wedge and you can bet if this gets passed, there will be more censoring laws further down the line... maybe ones you don't agree with the next time but it may be too late by then to do anything about it as the precedent will have been set. Think about it.